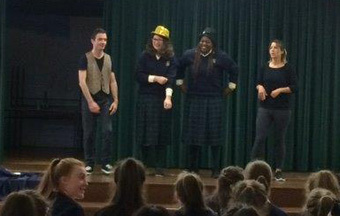 On Wednesday the 27th September, all of the TY students who study French were crowded into the hall to watch this year's French play, performed by the FTFS group (French Theatre For Schools). The name of the play was 'Le Texte Perdu' (The Lost Script). It followed the story of four actors who were searching for the missing script for their upcoming play, meeting various strange and eccentric characters along the way, such as une actrice très célèbre and les deux mecs - Zic et Zac. We all laughed and cringed at the slapstick comedy before us. We all agreed that the best part of the play was watching some of our friends being brought up and having to act, sing and dance along with the actors on stage! 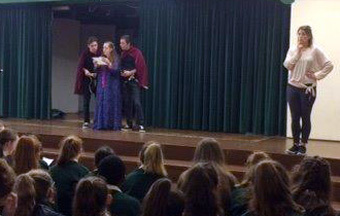 I volunteered to perform in the French play, before fully knowing what it was. I am a new student this year and hadn't seen the play before. Ms O’ Neill had given me the script a week or so before, so I learnt the lines that I had to perform thoroughly and I was nervous but excited to get up on stage. When I arrived and was told that I could read my lines from the script, I was relieved. The actors from the French theatre company were very friendly and reassured me throughout. I was nervous to read my lines on front of so many people but I was glad I had done it afterwards. It was much easier than I had expected and several other girls read lines too. Two girls even had to disco dance during the play, and I was glad I didn't have to! In the play, the actors spoke slowly so it would be easier to understand and made the audience participate by either: inviting people on stage to have a few lines or asking questions to the audience. It was very enjoyable and easy to understand. It was also a benefit to French students to prepare them for orals and aurals because we got to listen to real French accents. Overall, 4th year as a whole really enjoyed the French play and would definitely recommend it to the lower years in the school. It was a great opportunity to actively practice the French language in school. Je me suis amuseé très bien !